Achiamah Osei-Tutu MD, FAAD is a board-certified dermatologist specializing in hair restoration, aesthetic, medical, and surgicalskin care. After graduating from Binghamton University with a degree in Biology, Dr. Osei-Tutu received her medical degree from Stony Brook University School of Medicine. During medical school, she had the unique honor of being chosen as a Howard Hughes Medical Institute/ National Institutes of Health (NIH) Research Scholar. 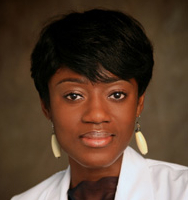 Dr. Osei-Tutu completed her medicine internship atMount Sinai Hospital and dermatology residency at the SUNY Health Sciences Center- Brooklyn, where she was selected Chief Resident in her final year. Although she is well experienced in all aspects of dermatology, she has had additional training in hair loss disorders and hair restoration. She has also been devoted to hair loss education- speaking at hair shows, putting together hair loss educational symposia, and partnering with stylists in New York to provide free hair loss screenings. She is an Associate Clinical Professor at St. Luke’s Roosevelt Hospital. She has authored/coauthored a number of academic publications. She is a member of the American Academy of Dermatology and an associate member of the International Society of Hair Restoration Surgeons. Dr. Osei-Tutu is sensitive to issues of multi-ethnic skin and is committed to providing her patients with personalized care.